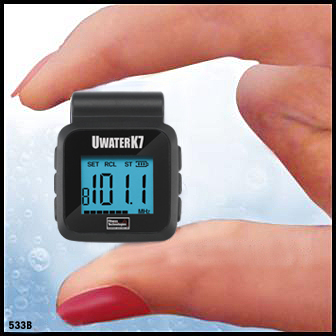 Its Sunday 19th Feburary 2012 and I have just been to the swimming pool with UwaterK7 waterproof radio for swimming. This waterproof radio works well for breast stroke and is just about acceptable for front crawl but does not work with backstroke, as the headphone wires need to be out of the water to get any radio reception. Hence although it’s a bit limited for certain swimming strokes it’s an excellent radio for water aerobics, running in rain, kayaking, surfing or windsurfing or kite boarding.or any sport or activity where head is above the water. The other thing I noticed that even on the lowest volume it is still quite loud but this may be dictated partly by the strength of the radio signal. I manged to listen to clear reception for both Radio 1 and Radio4. But I picked our the local radio station “Swansea Bay FM” which is the nearest station to the swimming pool (under a mile away) very well. This micro-sized entertainer clips securely onto headband, armband, bathing suit or goggles for swim-anywhere, go-anywhere, listening pleasure. Unique IPX8 case and 3D controls are 100% Waterproof. Lightweight, ergonomically-designed extra-soft silicon Ear-Tips (4 sets) seal water out and keep stereo sound in. Continuous play time 6 to 8 hours on a single charge of its built-in high performance (1000+ cycle) Lithium-Ion rechargeable battery. Our “Twist & Lock” earphones jack completely blocks water out and provides crucial long term protection against corrosion in treated and salt water – a problem which might damage regular devices. We also installed a large 1” easy-to-read LCD for clear visual communication in any water environment, plus 19-station presets with simple setting and recall functions. Since 1996 our Waterproof Audio Technologies (WAT) were featured in the New York Times, LA Times, Men’s Health (Europe), Swim World, Fitness Swimmer, Triathlete Magazine, CNET, as well as over 30 other publications (see “UWater in the media”). Also endorsed by the US National Sporting Goods Association. Designed in the USA. Patent Pending. Advanced Digital PLL FM Receiver 88 – 108 Mhz. 19-Station Presents. Easy setting and recall. Large screen (1”) highly visible LCD. I was wondering if you have the UwaterK7 available for sale in the UK yet? I tried to use this radio today for swimming. However, firstly the clasp broke as I tried to clip it onto my swimming costume and then as I entered the building which houses the pool, I lost the radio signal so never did try it in the water. Sorry. Hello, is Uwater K7 on stock? Do you ship outside UK to continental Europe? Thanks. 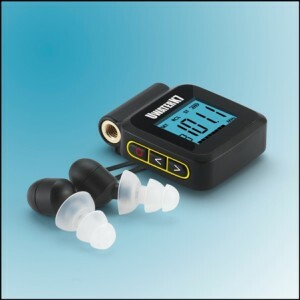 I am looking for a small radio for doing my swimming particularily crawl and was hoping that this radio really was waterproof and easy to use ? Do the earphones really stay in the ears ? I found the radio works best with breast stroke when you head is out of water ..the reception is patchy with front crawl as your head is under water at times! You would probably be better off with a mp3 player for front crawl in my opinion, such as splash gear or speedo aquabeat, if you wear goggles. Return it with a short note explaining fault & I will send you a replacement. I absolutely love the radio on this and the headphones do stay in the ears and yes the reception is patchy when completely submerged but I’ve tried out a few and this is the best so far. Unfortunately my second one steamed up after a few swims and Chris has been kind enough to send me a replacement so flippers crossed and it will all work out fine. Hi I am looking for a radio that allows me to listen to Talksport whilst swimming. The frequency is on AM or DAB not FM. Does that mean this is not suitable and if not any other products you can recommend? Previous post: Comparison Finis SWIMP3.1G to Finis SWIMP3.2G ?